Benita Hussain interviews Daniel Lacko, a sponsored outdoor adventurer writing the largest “WELCOME” in the world while exploring the Croatian coastline. AFTER THE DISSOLUTION of his team-building business, Croatian adventure journalist Daniel Lacko formulated a project that would get him some outdoor exercise while exploring adventure activities in his homeland, a country he had left unexplored even during his years of international travel. 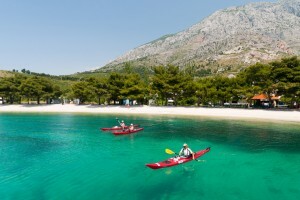 By forming the word “WELCOME” by hiking, climbing and kayaking along the Croatian coastline over the course of two months, he hoped to both promote nature-based activities before World Environment Day on June 5, 2011, as well as demonstrate Croatia as being more than a leisurely sailing and sunbathing destination. It’s not surprising that the Croatian National Tourist Board quickly sponsored him and his media team on this mission. I caught up with the effusive writer with a self-proclaimed “endorphin disorder” three-quarters of the way through his project. [BH]: Where are you currently, and how far have you come? [DL]: Right now I am at home, enjoying a three days break before returning to “writing”. Five letters done, two to go. “WELCO” is written. It is only “ME,” myself and I left. When was the moment you came up with the idea to travel through Croatia? I had a small adventure based team-building company which went bankrupt due to the recession, and I had to reset myself and start something new. During almost ten years of working in Croatia I was impressed with its beauty, long history and cultural heritage. After traveling around the world I realized how little I know about my own country. As a freelance outdoor journalist, I got the urge to return to writing about travels around Croatia. As I am also kind of an outdoor freak, my travels had to have something to do with adventure sports and human-powered action. And finally, I had to come up with some really good excuse for my wife and family to being outdoors for more than two months. The idea about “writing” the biggest WELCOME in the world just appeared. The rest is all blood, sweat and tears of joy. It is funny, isn’t it? I am writing the biggest WELCOME in the world but at the same time it will be the shortest travelogue ever, containing only one word. How did your team train for the trip? Actually we didn’t. It all came so suddenly. Although the Croatian Tourist Board was eager to support the project from the beginning, the final decision on the start-date was made just two weeks before the D-Day (or more precisely, the W-Day). It was kind of the last minute team gathering. But, as it often happens, it turned out to be just perfect. Photographer Luka [Tamaca], cameraman Marko [Rukavina], and on-site manager Cedo [Josipovic] are doing a great job of covering their [media] part of our mission. Concerning my physical shape and mileage, I could train only by walking, kayaking or biking; it’s been a trip to unknown [activities]. I know I have natural-born stamina, a lot of outdoor experience and a huge motivation to do it. But still, there were plenty of missing links. Now, after more than 70% of job done, I can say I enjoyed every mile and every second of this journey without need for even the weakest painkiller. How did you go about getting sponsors for this journey? The Tourist Board and Ministry of Tourism supported the project covering the costs and promoting it globally. And as the project advanced, more and more sponsors have been willing to participate in such an affirmative and original event, especially after we got the biggest Croatian media house, 24sata [or “24 hours”], as our partner. How have you changed individually, and how have you changed as a group? Except for the fact that I look little a more in-shape than before and am several days “out of shave,” the only thing I’ve noticed by now is probably a kind of an endorphin level disorder. From the first day I felt so lucky, having such good time and meeting extraordinary people. I was always an optimistic person but maybe now I’ve gone too far with this happy mood. What I can say is that our team is strong, efficient, and affirmative, with a good spirit and energy. We are an open project and invite people to join us on any part of our route. Also, we are meeting a lot of different people, from our friends, locals, officials, foreigners. The most common feedback we receive is: you are a great team. It probably means something. you’ve done together helped you learn more about yourselves and each other? This project definitely has enormous team-building effect. Somewhere I read the definition of a friend: it is the person who knows all about you but still loves you. In that context, we’ve really become good friends. Personally I realized I am capable to do much more than I thought. While I was kayaking on Kvarner Bay and my destination seemed to be almost unreachable, I looked around and realized that everything I could see from my kayak – all the mountains and islands, all that sea – I either had or would be passing through. Only on foot, biking or paddling. I think people today forget how much they actually can do. This project reminded me on that. Then again, a few days later, I was crawling on the ground desperately trying not to be blown away from the top of the highest Croatian mountain Dinara. The moment before, the famous Croatian wind “bura” boosted me and threw me a few meters away. We became aware of how small and fragile we are.